Mariner outboard decal set replica made from 175 hp Mariner Outboards from 1996, 1997, 1998 covers. 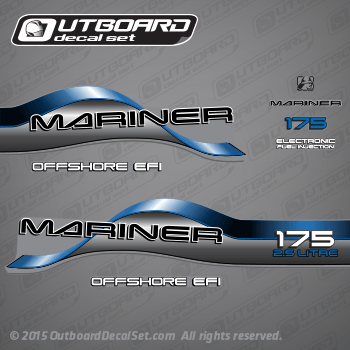 96, 97, 98 MARINER DECAL SET (MARINER 175 OFFSHORE EFI) 175HP 2.5L EFI. 1175412SD L, 1175412ST L, 1175412TD L, 1175412UD L, 1175412UT L, 1175422SD XL, 1175422TD XL, 1175422UD XL, 1175425SD CXL, 1175425TD CXL, 1175425UD CXL. All other hp and Blue set version available upon request. this set with little variations may work on 135 hp, 150 hp, 105 JET, 175 HP, 140 JET MAGNUM III and 200 hp covers.